We believe in leaving the world a better place than we found it. We believe in enhancing the environment and the beauty of our communities and neighborhoods. We believe in you and your ability to help us make that difference. Thank you for believing in us. 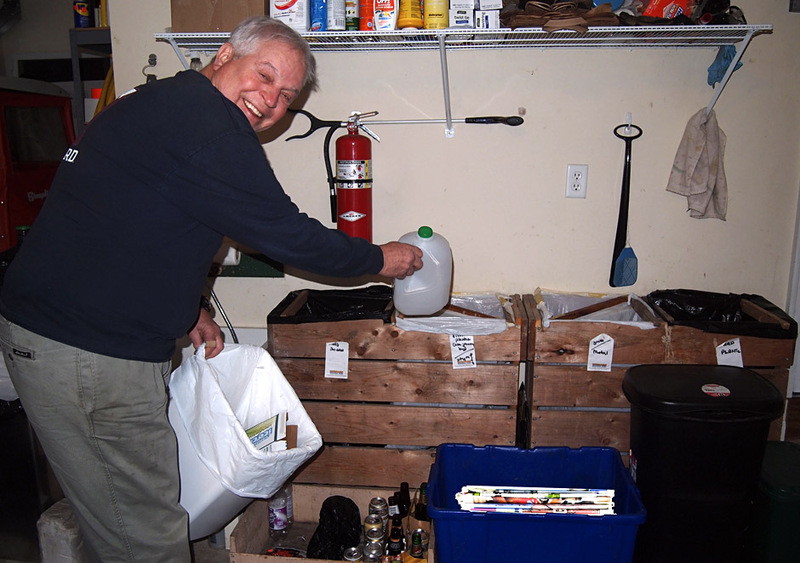 Dave White sorts recycling at his home in Twin Lake into homemade recycle bins constructed by his son-in-law. The trailer has been a great resource for those of us who want to be sustainable and recycle, but do not live where recycling options may be available. The fact that our employer provides this recycling option to us employees is not only appreciated, but shows that they are committed to more sustainable practices. We are extremely happy for the opportunity to offer such a great service to our employees and members. Not only do we recycle as an organization, but we take great pride in knowing that the “At-Work” trailer has encouraged our members and employees to join in the movement. I recycle both at home and at work. Being able to recycle at home reduces my trash by about 80%. The difference it makes is remarkable. We produce only about a tall kitchen garbage bag of trash every two weeks. At work we recycle huge amounts of cardboard, which would otherwise go into a landfill.